Pugs' compressed faces can cause breathing problems. Pugs are adorable. Unfortunately, the same things that make them cute, like their small bodies and squished faces, predispose them to certain health problems. Knowing the symptoms and consulting your vet is important: a vet can help you recognize and treat different pug ailments. To get the really bad one out of the way first, pug dog encephalitis or PDE is a very serious disease that affects only pugs. The cause is unknown and it is always fatal, though the disease may progress quickly or slowly. This disease causes the tissue around the brain to swell up, causing brain injuries. The symptoms include walking in circles, pressing the head against objects, seizures, and blindness. Though it cannot be cured, you should report these symptoms to your vet immediately in case the symptoms are of something more treatable. These dainty dogs don't deal well with extreme temperatures, so you need to watch your pug closely during warm weather or when he's exercising. Pugs are extremely prone to heat stroke. If it's warm and your pug starts breathing fast and heavy, or even throws up, you should wrap him in cold, wet towels or dunk him in a tub of cold water. If your pug's temperature is greater than 105 degrees, you should consult a vet immediately. 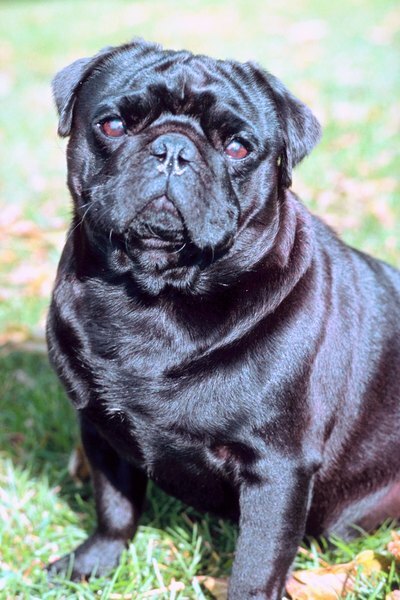 Aortic stenosis is a birth defect that plagues pugs (and other dogs). The aorta is the big blood vessel that brings fresh, oxygenated blood from the heart to the rest of the body. In aortic stenosis, the aorta is narrowed to the point that blood flows back into the heart. This can cause symptoms like fainting, poor tolerance of exercise and laziness (good luck spotting that last one in pugs). If you see these symptoms, you should consult your vet. The condition cannot be cured, but supportive treatments that can help your pug. Pugs' compressed faces are cute, but can cause trouble. In brachycephalic syndrome, the bones of a pug's face are shortened, but not all of the soft tissues. Because of this, extra tissue is scrunched up inside the pug's head, and can block airways. The symptoms vary from mild to life-threatening. If your pug has this condition, you will see loud breathing, snorting, snoring, wheezing and even fainting. If you see these symptoms, talk to a vet. Surgery to remove the extra tissue can help your pug. Pug Village: What Is Aortic Stenosis? Pug Village: PDE: Just the Facts!